Adds a Bag of Trash to your inventory. Put items into this container to permanently remove them from the game and more importantly remove them from the savegame file. Some of the assets in this file are variations of assets in JustinOther's "Bag of Holding" Mod. I do have permission to use them in this Mod. Another author wishing to use these assets (or variations) should attempt to contact JustinOther and/or zbobg for permission. It is very likely that permission will be given. Adds a Bag of Trash to your inventory. Put items into this container to permanently remove them from the game and more importantly remove them from the savegame file. Activate this container from your inventory (in the Apparel/Armor category) or drop it on the ground and activate like any container. When you put items into the Trash Bag you get their gold value added to your player, the item will be permanently deleted from the game and will be deleted from the savegame file. WARNING! Once you close the Trash Bag all items in it will be permanently deleted. By request there are now two optional files: "Bag of Trash Minimum Gold" and "Bag of Trash No Gold. The minimum version gives back 1/3 of the full value of items, the no gold version just deletes items put in the bag. The were requested by users who did not want to break the game economy. The three variations can be installed and active at the same time, however, all three bags are named "Bag of Trash" so it will be hard to tell them apart. Ordinarily a user will have only one of the Bags marked as active in the Skyrim Launcher. While the Trash Bag is open you can remove items and gold will be removed (not for the No Gold version) from your player, this is to prevent loss of items accidentally placed into the Trash Bag. 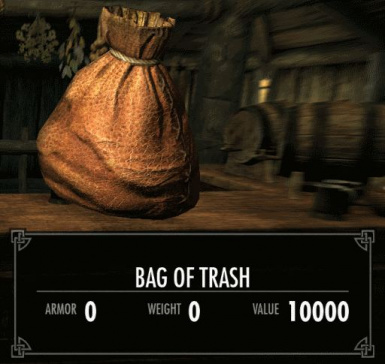 To install, put the BagofTrash.bsa and BagofTrash.esp files in your Skyrim/Data folder. To use, click on the bag in your inventory (in Apparel/armor), close your inventory view. The bag will open an inventory view like any container, use Store and Take as you would for any ordinary container. To uninstall, simply delete the BagofTrash.bsa and BagofTrash.esp files. This is kind of a cheat, but I got tired of visiting numerous vendors trying to sell all my excess inventory especially high value items. Once you have maxed out your vendor skill (Speech) there's no good reason to sell only to vendors anyway. I used to just put excess items into empty barrels then let the game delete them. The Trash Bag does get me back some gold and positively deletes the items. Credit is given to JustinOther for the use of variations of his "Bag of Holding" scripts. v1.1: Made the Bag Player owned.